Our theme for the month of September is "Dusk to Dawn". OK, so this means we want to see night time scenes. In other words, no sunshine. Your background and foreground images should be stamped or digi'd onto the paper to make a scene. After the stamped scene is laid you may add dimensional aspects to the scene. 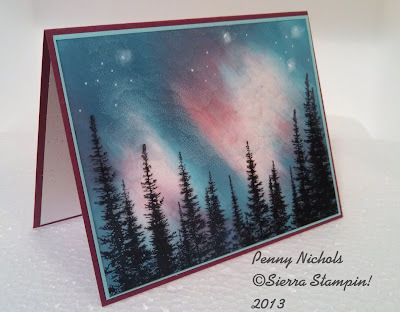 Penny, who is #2 in the challenge posts all her work to the Stampscapes II Yahoo group. Unfortunately, you may not view the items in this group unless you are a member, so I am posting the picture here for all to see and comment on. OK, so now you have an idea of what to do with the theme "Dusk to Dawn". You may enter up to 3 times and as many challenges as you wish. If you do not have a blog or account on Split Coast Stampers, then just email me a picture of the piece and I will add it to one of our posts. My comment is for Penny as I can't leave one for her normally. I love your card Penny, you've made an amazing dusk/nightime sky above the trees, the colours are lovely. I'm glad you've taken the time to join us at Craft a Scene this month. 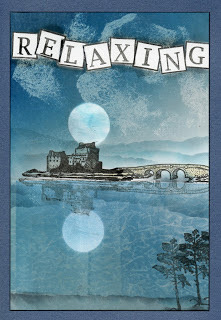 Just wanted to echo the previous comments - Penny, your sky is beautiful and makes a simple card very special. Thanks for sharing. Thanks for all the nice comments. I am new to Stampscapes and fairly new to new stamping. Love the Stampscapes line. beautiful sky!!! you made a beautiful scene. Craft a Scene September Theme - "Dusk to Dawn"